"Yesterday morning I went to the Sistine Chapel to vote tranquilly. Never could I have imagined what was about to happen. As soon as the danger for me had begun, the two colleagues who were beside me whispered words of encouragement. One said: "Courage! If the Lord gives a burden, he also gives the strength to carry it." The other colleague said: "Don't be afraid; there are so many people in the whole world who are praying for the new Pope." When the moment of decision came, I accepted. Then there was the question of the name, for they also ask what name you wish to take, and I had thought little about it. My thoughts ran along these lines: Pope John had decided to consecrate me himself in St Peter's Basilica, then, however unworthy, I succeeded him in Venice on the Chair of St Mark, in that Venice which is still full of Pope John. He is remembered by the gondoliers, the Sisters, everyone. Then Pope Paul not only made me a Cardinal, but some months earlier, on the wide footbridge in St Mark's Square, he made me blush to the roots of my hair in the presence of 20,000 people, because he removed his stole and placed it on my shoulders. Never have I blushed so much! 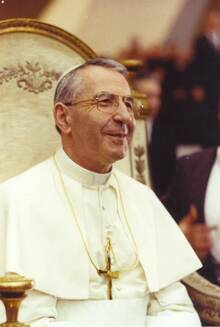 For that reason I said: "I shall be called John Paul." I have neither the "wisdom of the heart" of Pope John, nor the preparation and culture of Pope Paul, but I am in their place. I must seek to serve the Church. I hope that you will help me with your prayers." Next we embrace in thought and greet with paternal affection the whole Church of Christ. We greet this assembly, representing as it were the whole Church, which is gathered in this place — a place filled with works of piety, religion, and art, which is the attentive custodian of the tomb of the Chief of the Apostles. We then greet the Church that is watching us and listening to us at this moment through the modern media of social communication. We greet also with reverence and affection all the people in the world. We regard them and love them as our brothers and sisters, since they are children of the same heavenly Father and brothers and sisters in Christ Jesus (cf Mt 23:8f). The Word of God that we have just been listening to has presented the Church to us as in crescendo, first, as prefigured and glimpsed by the Prophet Isaiah (cf Is 2:2-5) in the form of the new Temple with the nations streaming towards it from all sides, anxious to know the Law of God and to observe it with docility, while the terrible weapons of war are transformed into instruments of peace. But Saint Peter reminds us that this mysterious new Temple, the pole of attraction for the new humanity, has a cornerstone, a living, chosen and precious cornerstone (cf 1 Pt 2:4-9), which is Jesus Christ, who founded his Church on the Apostles and built it on blessed Peter, their leader (cf Lumen Gentium, 19). You are Peter, and on this rock I will build my church" (Mt 16:18) are the weighty, great and solemn words that Jesus speaks to Simon, son of John, after his profession of faith. This profession of faith was not the product of the Bethsaida fisherman's human logic or the expression of any special insight of his or the effect of some psychological impulse; it was rather the mysterious and singular result of a real revelation of the Father in heaven. Jesus changes Simon's name to Peter, thus signifying the conferring of a special mission. He promises to build on him his Church, which will not be overthrown by the forces of evil or death. He grants him the keys of the kingdom of God, thus appointing him the highest official of his Church, and gives him the power to interpret authentically the law of God. In view of these privileges, or rather these superhuman tasks entrusted to Peter, St Augustine points out to us: "Peter was by nature simply a man, by grace a Christian, by still more abundant grace one of the Apostles and at the same time the first of the Apostles" (In Ioannis Evang). With surprised and understandable trepidation, but also with immense trust in the powerful grace of God and the ardent prayer of the Church, we have agreed to become Peter's Successor in the See of Rome, taking on us the yoke that Christ has wished to place on our fragile shoulders. We seem to hear as addressed to us the words that Saint Ephraem represents Christ as speaking to Peter: "Simon, my apostle, I have made you the foundation of the Holy Church. I have already called you Peter because you will support all the edifices. You are the superintendent of those who will build the Church on earth . . . You are the source of the fountain from which my doctrine is drawn. You are the head of my apostles . . . I have given you the keys of my kingdom" (Sermones in hebdomadam sanctam). From the moment we were elected throughout the days that followed, we were deeply struck and encouraged by the warm manifestations of affection given by our sons and daughters in Rome and also by those sending us from all over the world the expression of their irrepressible jubilation at the fact that God has again given the Church her visible Head. Our mind re-echoes spontaneously the emotion-filled words that our great saintly Predecessor, St Leo the Great, addressed to the faithful of Rome: "Blessed Peter does not cease to preside over his See. He is bound to the eternal Priest in an unbroken unity . . . Recognize therefore that all the demonstrations of affection that you have given me because of fraternal amiability or filial devotion have with greater devotedness and truth been given by you and me to him whose See we rejoice to serve rather than preside over it" (Sermo V, 4-5: PL 54, 155-156). Surrounded by your love and upheld by your prayer, we begin our apostolic service by invoking, as a resplendent star on our way, the Mother of God, Mary, Salus Populi Romani, and Mater Ecclesiae, whom the Liturgy venerates in a special way in this month of September. May Our Lady, who guided with delicate tenderness our life as a boy, as a seminarian, as a priest and as a bishop, continue to enlighten and direct our steps, in order that, as Peter's voice and with our eyes and mind fixed on her Son Jesus, we may proclaim in the world with joyous firmness our profession of faith: "You are the Christ, the Son of the living God" (Mt 16:16). Amen." "Up there in Veneto I heard it said: every good thief has his devotion. The Pope has a number of devotions; among others, to St Gregory the Great, whose feast falls today. In Belluno the seminary is called Gregorian in honour of St Gregory the Great. I spent 7 years there as a student and 20 as a teacher. It so happens that today, 3 September, he was elected Pope and I am officially beginning my service of the universal Church. He was a Roman, who became the first Magistrate of the city. Then he gave everything to the poor, entered a monastery, and became the Pope's Secretary. On the Pope's death, he was elected and he did not want to accept. The Emperor, the people, intervened. Afterwards, he finally accepted and wrote to his friend Leandro, Bishop of Seville: "I feel like weeping more than talking." And to the Emperor's sister: "The Emperor has wanted a monkey to become a lion." One sees that in those times, too, it was difficult to be Pope. He was so good to the poor; he converted England. Above all he wrote beautiful books; one is the "Pastoral Rule": it teaches bishops their trade, but, in the last part, it has the following words: "I have described the good shepherd but I am not one, I have shown the shore of perfection at which to arrive, but personally I am still in the breakers of my faults and my shortcomings, and so: please", he said "so that I will not be shipwrecked, throw me a safety belt with your prayers." I say the same; yet it is not just the Pope who needs prayers, but the world. A Spanish writer has written: "the world is going wrong because there are more battles than prayers." Let us try to see that there may be more prayers and fewer battles." "At Camp David, in America, Presidents Carter and Sadat and Prime Minister Begin are working for peace in the Middle East. All men are hungry and thirsty for peace, especially the poor, who pay more and suffer more in troubled times and in wars; for this reason they look to the Camp David meeting with interest and great hope. The Pope, too, has prayed, had prayers said, and is praying that the Lord may deign to help the efforts of these politicians. I was very favourably impressed by the fact that the three Presidents wished to express their hope in the Lord publicly in prayer. President Sadat's brothers in religion are accustomed to say as follows: "there is pitch darkness, a black stone and on the stone a little ant; but God sees it, and does not forget it". President Carter, who is a fervent Christian, reads in the Gospel; "Knock, and it will be opened to you; ask, and it will be given you. Even the hairs of your head are all numbered." And Premier Begin recalls that the Jewish people once passed difficult moments and addressed the Lord complaining and saying: "You have forsaken us, you have forgotten us!" "No!" — He replied through Isaiah the Prophet — "can a mother forget her own child? But even if it should happen, God will never forget his people". With these sentiments I invite you to pray together with the Pope for each of us, for the Middle East, for Iran, and for the whole world." "Martedì prossimo, quasi 12 milioni di ragazzi tornano a scuola. Il Papa spera di non rubare il mestiere al ministro Pedini con ingerenze indebite se porge i più cordiali auguri sia agli insegnanti che agli scolari. Preghiamo il Signore che aiuti i professori, studenti e anche le famiglie che guardano la scuola con lo stesso affetto e con la stessa preoccupazione del Papa." "Heartfelt thanks to the Cardinal Vicar for the delicate words with which — in the name of the Episcopal Council, the Chapter of the Lateran, the Clergy, the men and women Religious, and of the faithful — he decided to express the devotion and the intentions of effective collaboration in the diocese of Rome. The first concrete evidence of this collaboration is the immense sum placed at my disposal in order to provide with a church and a parochial structure a peripheral area of the City hitherto deprived of this essential community help for the Christian life. Truly touched, I thank you. The Master of Ceremonies has chosen the three lessons for this solemn liturgy. He has judged them suitable, and I wish to explain them to you. The first lesson (Is 60:16) can be referred to Rome. Everyone knows that the Pope acquires authority over the whole Church in as much as he is Bishop of Rome, that is, successor of Peter in this city. Thanks especially to Peter, the Jerusalem of which Isaiah spoke can be considered a figure, a foretelling of Rome. Of Rome, too, in as much as it is the See of Peter, the place of his martyrdom and the centre of the Catholic Church, it can be said: "the Lord will arise upon you, and his glory will be seen ... the nation shall come to your light" (Is 60:2). Recalling the pilgrimages of the Holy Year and those that continue with a constant flow during the normal years, one can, with the prophet, address Rome as follows: "Lift up your eyes round about and see; ... your sons shall come from afar ... the abundance of the sea shall be turned to you, the wealth of the nations shall come to you" (Is 60:4,5). This is an honour for the Bishop of Rome and for you all. But it is also a responsibility. Shall the pilgrims find here a model of a true Christian community? With the help of God shall we, bishop and faithful, be able to cause to come true here the words of Isaiah, written under those first cited, namely: "Violence shall no more be heard in your land ... your people shall all be righteous" (Is 10:18, 21)? A few moments ago, Professor Argan, Syndic of Rome, made me a courteous address of greetings and good wishes. Some words of his caused me to think of one of the prayers that I recited as a child with Mamma. It went like this: "the sins that cry for vengeance in the presence of God are ... to oppress the poor, to defraud the workers of a just wage." In his turn, the Parish Priest questioned me at school on the Catechism: "Why are the sins that cry for vengeance in the presence or God among the more grievous and harmful?" Reply: ... "Because they are directly contrary to the good of mankind and are most hateful in as much as, more than others, they provoke the chastisements of God" (Catechism of Pius X, 154). Rome will be a true Christian community if God is honoured by you not merely with a multitude of the faithful in the churches, not merely with private life that is lived morally, but also with love for the poor. These, the Roman deacon Lawrence said, are the true treasures of the Church. They must be helped, however, by those who can, to have more and to be more, without becoming humiliated and offended by ostentatious riches, by money squandered on futile things and not invested — in so far as is possible — in enterprises of advantage to all. The second lesson (Heb 13:7-8; 15-17; 20-21) can be applied to the faithful of Rome. As I have said, the Master of Ceremonies has chosen it. I confess that when it speaks of obedience it places me in a slight embarrassment. Today, when personal human rights are confronted with the rights of authority and of the law, it is so difficult to convince! In the Book of Job there is a description of a war-horse: he leaps like a locust and snorts; he paws the ground with his hoof, then he hurls himself fiercely forward; when the trumpet sounds he neighs with delight; he smells the battle from afar, the cries of the captains and the noise of the troops (cf Job 39:10-25). The symbol of liberty. Authority, on the contrary, is like the prudent rider: he mounts the horse and, now with gentle voice, now making judicious use of the spurs, of the bridle and of the whip, he urges it on or controls its impetuous course, curbs it and restrains it. To reconcile the horse and the rider, liberty and authority, has become a social problem. It is likewise with the Church. At the Council there was an attempt to resolve it in the fourth chapter of Lumen Gentium. Here are the Conciliar indications for the" rider": "The sacred pastors know very well how much the laity contribute to the welfare of the whole Church. They know that they themselves were not established by Christ to undertake alone the whole salvific mission of the Church to the world, but that it is their exalted office to be shepherds of the faithful and to recognise the latter's contribution and charisms in such a way that all, in their measure, will with one mind cooperate in the common task" (Lumen Gentium, 30). Further, the pastors are also aware that "in the decisive battles it is at times from the front that the happiest initiatives begin" (Lumen Gentium, 37). On the other hand, here is a conciliar indication for the "high-spirited war-horse", that is, for the laity: "the faithful should acquiesce to the bishop as the Church to Jesus Christ and as Jesus Christ to the Father" (Lumen Gentium, 27). Let us pray that the Lord will aid both the bishop and the faithful, both the rider and the horses. It has been said to me that in the diocese of Rome there are numerous persons who devote themselves to the faithful, numerous catechists; many also await a signal to intervene and to collaborate. May the Lord help us all to build at Rome a living and active Christian community. It is not pointlessly that I have quoted the fourth chapter of Lumen Gentium: it is the chapter on "ecclesial communion". What has been said, however, has special reference to the laity. The priests, the men and women religious, have a special position, bound as they are either to the promise or to the vow of obedience. I recall, as one of the solemn points of my existence, the moment in which, with my hands in those of the bishop, I said: "I promise". From that time, I considered myself bound for my whole life, and never have I thought that it was a matter of an unimportant ceremony. I hope that the priests of Rome think likewise. To them and to the Religious, St Francis de Sales would recall the example of St John the Baptist who lived in the desert, far from the Lord, yet so greatly desiring to be near to him. Why? Through obedience: "He knew", writes the saint, "that to find the Lord outside of obedience meant to lose him" (Oeuvres, Annecy). The third lesson (Mt 28: 16-20) reminds the Bishop of Rome of his duties. The first is to teach, proposing the Lord's word with fidelity both to God and to the listeners; with humility, but with fearless sincerity. Among my holy predecessors, bishops of Rome, there are two who are also Doctors of the Church: St Leo, conqueror of Attila, and St Gregory the Great. In the writings of the first are very high theological thought and a sparkling Latin style that is marvellously designed; I do not think that I could imitate him, not even from afar. The second, in his books, is "like a father who instructs his children and sets them apart out of his solicitude for their eternal salvation" (I. Schuster, Liber Sacramentorum). I would like to try to imitate the second, who dedicates the entire third book of his Regula Pastoralis to the theme of how teaching should be done, that is, how the pastor should instruct. For 40 whole chapters Gregory indicates in a concrete way various forms of instruction according to the various circumstances of social conditions, age, health, and moral temperament of the hearers. Poor and rich, cheerful and melancholic, superiors and subjects, learned and ignorant, cheeky and shy, and so forth; all are there in this book, it is like the valley of Jehoshaphat. At the second Vatican Council, there was a seemingly new thing which came to be called "pastoral approach", not indeed that which was taught to the pastors, but that which the pastors did to face up to the needs, the anxieties, the hopes of men. This "new" approach had already been applied many centuries earlier by Gregory, both in preaching and in the government of the Church. The second duty, expressed in the word "baptize", refers to the sacraments and to the whole of the liturgy. The diocese of Rome has followed the programme of the CEI "Evangelization and Sacraments". It already knows that evangelization, sacraments, and holy life are three moments on the one course; evangelization prepares for the sacrament, the sacrament draws him who has received it to live in a Christian way. I should like this great concept to be applied in ever increasing measure. I should like also that Rome should in fact give a good example of Liturgy celebrated devoutly and without ill-placed "creativity". Certain abuses in liturgical matters have succeeded, through reaction, in favouring attitudes that have led to a taking up of positions that in themselves cannot be upheld and are in contrast with the Gospel. In appealing with affection and with hope to the sense of responsibility of everyone, before God and the Church, I should like to be able to give an assurance that every liturgical irregularity will be diligently avoided. And now I have come to the last episcopal duty: "to teach and to observe"; it is the diaconia, the service of guiding and governing. Although already for 20 years I have been Bishop at Vittorio Veneto and at Venice, I admit that I have not yet "learned the job" well. At Rome I shall put myself in the school of St Gregory the Great who writes: "(the pastor) should, with compassion, be close to each one who is subject to him; forgetful of his rank he should consider himself on a level with the good subjects, but he should not fear to exercise the rights of his authority against the wicked. Remember: while every subject lifts up to heaven that which he has done well, no one dares to censure that which he has done badly; when he puts down vices he does not cease, with humility, to recognize himself as on the level of the brother whom he has corrected; and he considers that he is all the more a debtor before God, in as much as his actions remain unpunished before men" (Regula Pastoralis). The explanation of the lessons ends here. Let me add only one more thing: it is God's law that one cannot do good to anyone if one does not first of all wish him well. On account of this, St Pius V, on becoming Patriarch of Venice, exclaimed in San Marco: "What would become of me, Venetians, if I did not love you?" I say something similar: I can assure you that I love you, that I desire only to enter into your service and to place the poor powers that I have, however little they are, at the disposal of all." "Yesterday afternoon I went to St John Lateran. Thanks to the Romans, to the kindness of the Mayor and some authorities of the Italian Government, it was a joyful moment for me. On the contrary, it was not joyful but painful to learn from the newspapers a few days ago that a Roman student had been killed for a trivial reason, in cold blood. It is one of the many cases of violence which are continually afflicting this poor and restless society of ours. The case of Luca Locci, a seven-year-old boy kidnapped three months ago, has come up again in the last few days. People sometimes say: "We are in a society that is all rotten, all dishonest." That is not true. There are still so many good people, so many honest people. Rather, what can be done to improve society? I would say: let each of us try to be good and to infect others with a goodness imbued with the meekness and love taught by Christ. Christ's golden rule was: "Do not do to others what you do not want done to yourself. Do to others what you want done to yourself." And he always gave. Put on the cross, not only did he forgive those who crucified him, but he excused them. He said: "Father, forgive them for they know not what they do." This is Christianity, these are sentiments which, if put into practice would help society so much. This year is the 30th anniversary of the death of Georges Bernanos, a great Catholic writer. One of his best-known works is "Dialogues of the Carmelites". It was published the year after his death. He had prepared it working on a story of the German authoress, Gertrud von Le Fort. He had prepared it for the theatre. It went on the stage. It was set to music and then shown on the screens of the whole world. It became extremely well known. The fact, however, was a historical one. Pius X, in 1906, right here in Rome, had beatified the 16 Carmelites of Compiègne, martyrs during the French revolution. During the trial they were condemned "to death for fanaticism". And one of them asked in her simplicity: "Your Honour, what does fanaticism mean?" And the judge: "It is your foolish membership of religion." "Oh, Sisters," she then said, "Did you hear, we are condemned for our attachment to faith. What happiness to die for Jesus Christ!" They were brought out of the prison of the Conciergerie, and made to climb into the fatal cart. On the way they sang hymns; when they reached the guillotine, one after the other knelt before the Prioress and renewed the vow of obedience. Then they struck up "Veni Creator"; the song, however, became weaker and weaker, as the heads of the poor Sisters fell, one by one, under the guillotine. The Prioress, Sister Theresa of St Augustine, was the last, and her last words were the following: "Love will always be victorious, love can do everything." That was the right word, not violence, but love, can do everything. Let us ask the Lord for the grace that a new wave of love for our neighbour may sweep over this poor world." "1. Il nostro pensiero si rivolge in questi giorni di agosto agli avvenimenti che, nello scorso anno, ebbero luogo proprio in questo mese. Sabato, 12 agosto, la Chiesa Romana, la Città e il Mondo intero davano l’ultimo saluto al grande Papa Paolo VI, le cui spoglie furono deposte vicino a quelle di Giovanni XXIII; e i Cardinali riuniti a Roma iniziavano i preparativi per il Conclave, fissato per il 26 agosto. Era anch’esso un sabato. Per la prima volta un Collegio così numeroso e così vario si accingeva ad eleggere un nuovo Successore di San Pietro. Una gran parte degli elettori, precisamente cento, partecipava per la prima volta all’elezione del Papa, mentre i rimanenti 11 vi avevano già preso parte. Eppure fu sufficiente un solo giorno, il 26 agosto, perché Roma e il Mondo ricevessero nella stessa sera la notizia della elezione. “Annuntio vobis gaudium magnum: habemus Papam”, comunicava verso le ore 18 il Cardinale Protodiacono dalla loggia della basilica. Il nuovo Papa scelse due nomi: Giovanni-Paolo. Ricordo bene quel momento, quando nella Cappella Sistina egli espresse la sua volontà: “Voglio portare i nomi di Giovanni e di Paolo”. Questa decisione aveva una sua convincente eloquenza. Personalmente mi è sembrata una decisione carismatica. Così dunque il sabato, 26 agosto, giorno dedicato alla Madre di Dio (in Polonia si celebra in questo giorno la festa della Madonna Nera di Jasna Gora, cioè di Chiaromonte) si presentò a noi il Papa Giovanni Paolo I. E fu accolto da Roma e dalla Chiesa con grande giubilo. In questa spontanea gioia vi era gratitudine verso lo Spirito Santo perché, in modo così visibile, aveva diretto i cuori degli elettori e contro tutti i calcoli e le previsioni umane, “mostrava colui che egli stesso aveva designato” (cf. At 1,24). E questa grande gioia e riconoscenza della Chiesa non fu turbata neppure nell’inattesa morte di Papa Giovanni Paolo I. Solo per trentatré giorni aveva esercitato il suo ministero pastorale sulla cattedra romana, alla quale era stato mostrato piuttosto che dato, “ostensus magis quam datus”, parole che furono pronunciate in occasione della morte di Leone XI, anch’essa improvvisa. 2. Il pontificato di Giovanni Paolo I, sebbene della durata di meno di cinque settimane, ha tuttavia lasciato un’impronta particolare nella sede romana e nella Chiesa Universale. Forse questa impronta non è ancora del tutto delineata: essa viene chiaramente percepita. Per decifrarla fino in fondo occorre una più ampia prospettiva. Solo con l’andar degli anni, i disegni della Provvidenza divengono più comprensibili alle menti abituate a giudicare soltanto secondo le categorie della storia umana. Un momento però di questo breve pontificato sembra particolarmente eloquente per tutti coloro che hanno guardato alla figura di Giovanni Paolo I, ed hanno seguito con attenzione la sua breve attività. Essa si è svolta in un periodo in cui – dopo la chiusura del Sinodo dei Vescovi, dedicato alla catechesi (ottobre 1977) – la Chiesa incominciava ad assimilare i frutti di questo grande lavoro collegiale e, soprattutto, attendeva la pubblicazione del relativo documento, che i partecipanti al Sinodo avevano chiesto a Paolo VI. Purtroppo la morte non permise a questo grande Papa di pubblicare la sua esortazione su quel tema chiave per la vita di tutta la Chiesa. Anche Giovanni Paolo I non ebbe il tempo di farlo. Troppo corto, infatti, il suo ministero pontificale. Sebbene non sia riuscito a pubblicare il documento dedicato alla catechesi, tuttavia egli è riuscito, è certamente riuscito, a manifestare e a confermare con le proprie azioni che la catechesi è quel fondamentale e insostituibile compito dell’apostolato e della pastorale, al cui svolgimento tutti debbono contribuire e per il quale tutti nella Chiesa debbono sentirsi responsabili: il Papa al primo posto. Giovanni Paolo I non ha potuto promulgare col proprio nome il documento in parola; tuttavia ha avuto il tempo di dimostrare e affermare col proprio esempio che cosa è, e che cosa deve essere la catechesi nella vita della Chiesa dei nostri tempi. Per questo sono stati sufficienti i trentatré giorni del suo pontificato. E quando, tra breve, apparirà il documento dedicato alla catechesi, bisognerà ricordare per sempre che l’intero singolare pontificato di Giovanni Paolo I, “ostensus magis quam datus”, è stato principalmente un vivo commentario a questo documento e a questo tema. Si può dire che il testamento del Papa sia costituito da tale documento sulla catechesi. Egli, infatti, non ha lasciato altro testamento. 3. La domenica del 26 agosto – nella ricorrenza del primo anniversario della elezione di Giovanni Paolo I alla cattedra di San Pietro – desidero recarmi nel suo paese natale a Canale d’Agordo, nella diocesi di Belluno. Lo faccio per un bisogno del mio cuore. Lo faccio anche per rendere omaggio al mio immediato Predecessore (dal quale ho ereditato il nome) e a quel pontificato, attraverso il quale ci parla una verità che è più grande di quella umana. La Chiesa vivente in terra: a Roma e in tutto il mondo è stata illuminata da questa verità che supera quella umana e che nessuna storia può abbracciare ed esprimere, verità, tuttavia, che è stata espressa con grande forza nel Vangelo del Signore: “Il tempo ormai si è fatto breve” (1Cor 7,29)... “Sì, verrò presto” (Ap 22,20). Sembra decisamente che il pontificato di Giovanni Paolo I si possa riassumere in quest’unica frase: “Vieni, Signore Gesù”, “Maranatha” (Ap 22,20). L’Eterno Padre l’ha ritenuta la più necessaria alla Chiesa e al mondo: per ciascuno di noi e per tutti senza alcuna eccezione. E su questa frase dobbiamo soffermarci, mentre si avvicina l’anniversario dell’elezione e, tra breve, della morte di Papa Giovanni Paolo I, servo dei servi di Dio." "Prima di rivolgere il mio saluto ai particolari gruppi, presenti a questa udienza, desidero richiamare pressantemente la vostra attenzione su una dolorosa notizia, che da alcuni giorni ci ha colpiti: il rapimento in Umbria, di un ragazzo di tredici anni, di nome Guido Freddi! Siamo tutti intimamente sbigottiti per questo nuovo episodio di malvagità e di violenza, che offende la vita civile, e la rende insicura e pericolosa; qui non si tratta di sciagure o di fenomeni naturali, ma della voluta e preparata intenzione di far soffrire, per la sconsiderata, esecrabile brama del denaro. Mentre raccomando alle vostre preghiere il ragazzo rapito e i suoi cari, invoco dal Signore la grazia del ravvedimento e della conversione, affinché al più presto in quella desolata famiglia ritornino la serenità e la gioia." "My special greetings go to the Chinese Classic Dance Group of the National Taiwan Academy of Arts. It is a pleasure to have your presence at this audience, and to witness the expression of your art. Through your performance may the uplifting message of beauty touch the lives of many men and women in our day." "Desidero esprimere la mia paterna soddisfazione a voi tutti, giovani fanciulli presenti a questa udienza, per la vivacità e l’entusiasmo che vi distingue e che è eloquente dimostrazione del vostro amore per Gesù e per il Papa, suo vicario in terra. Vi auguro che la vostra gioia rimanga sempre inalterata e sia continua irradiazione della luce interiore della retta coscienza, costantemente vigile a dirigere verso il bene le vostre azioni, ad ispirarvi sentimenti di fraterna solidarietà e di generosa collaborazione, a tutti i livelli. Vi accompagna in tale compito la mia Benedizione, che estendo ai vostri familiari." "E voi, carissimi infermi, lo sapete, avete un posto privilegiato nel cuore del Papa. Come non fare oggetto di particolari premure voi che svolgete nella Chiesa il ruolo singolare della sofferenza umilmente accettata e che, pertanto, vi trasforma in carità verso i fratelli? Mentre con animo riconoscente rendo pubblica questa vostra testimonianza vi invito, a somiglianza di Cristo crocifisso, a continuare a fare come un calice di propiziazione e d’intercessione i vostri dolori fisici e morali. Vi sia di sollievo la mia paterna Benedizione che imparto a voi e alle vostre rispettive famiglie." "Agli sposi novelli una parola di felicitazione, di augurio e di incoraggiamento. Avete realizzato il sogno più bello della vostra vita: e la grazia del sacramento del matrimonio si è effusa su di voi a garanzia, da parte di Dio, del vostro amore e della vostra reciproca donazione. Con Gesù, anche voi avete vinto il mondo. Confidate sempre nell’aiuto divino che avete, per così dire, a portata di mano specialmente nelle ore di tristezza e di difficoltà. Siate sempre con Cristo: egli è il vostro conforto, il vostro ristoro, il segreto della vostra vittoria, vera e duratura felicità. Vi benedico di gran cuore." "Un grazie paterno e affettuoso a voi, Ministranti dell’arcidiocesi di Malta, che da alcuni anni venite a trascorrere il periodo estivo a Roma per disimpegnare lodevolmente il vostro servizio liturgico nella Basilica Vaticana. È una meritoria vacanza la vostra che mentre rende gloria a Dio è dimostrazione di fede e di bontà. Tornando alla vostra bella isola vi sia d’incitamento a progredire sempre nel bene anche l’amore del Papa; che si estende a tutti i vostri connazionali. Con la mia Benedizione Apostolica." "Un particolare saluto porgo al gruppo di fedeli di Petriolo, i quali, guidati dal loro Arcivescovo, Monsignor Cleto Bellucci, sono qui, oggi, in occasione del venticinquesimo anniversario della elevazione a “santuario” del loro tempio cittadino, dedicato alla Madonna della Misericordia. Volentieri accolgo il loro desiderio di benedire il nuovo portale destinato al Santuario, con l’esortazione a guardare sempre con fede e con fiducia alla santissima Vergine, che è – come diciamo nella ben nota preghiera – madre di misericordia, vita, dolcezza e speranza nostra." "Ai numerosi dirigenti del Movimento Giovanile Missionario delle diocesi d’Italia, presenti a questa udienza, porgo un paterno saluto e un cordiale grazie per essere venuti a manifestare al Papa sentimenti di filiale devozione e di incondizionata fedeltà. Il Congresso Nazionale, che è stato promosso dalle Pontificie Opere Missionarie, e al quale state partecipando, sta a significare che voi possedete piena consapevolezza e ferma volontà di continuare a prestare, con intelligenza e diligenza, la vostra opera nelle Chiese locali per contribuire “all’espansione e alla dilatazione del Corpo di Cristo, sì da portarlo il più presto possibile alla sua pienezza” (cf. Ad Gentes, 36). Il Papa, dunque, apprezza molto tale vostro impegno, incoraggia il vostro nobile lavoro e vi esorta a perseverare in esso, sempre consapevoli di fare cosa gradita al Signore, proficua alla Chiesa e tanto necessaria al mondo intero." "Aux six cents pèlerins du diocèse de Strasbourg, venus à Rome sous l’égide du Mouvement “Pax Christi”, j’adresse un salut spécial et mes encouragements. Fidèles au thème de votre pèlerinage, gardez toujours “ le souci de toutes les Eglises ”, spécialement de celles qui ont besoin d’aide morale, spirituelle et matérielle. Agir ainsi, c’est réaliser le grand commandement du Seigneur Jésus, c’est vivre le Mystère de l’Eglise, c’est aussi contribuer à la paix du monde. Que Dieu soutienne et bénisse vos personnes et vos activités apostoliques!" "I am happy to extend a special welcome to the group of Christian Brothers from Australia and New Zealand. During your pilgrimage, which will take you next to Ireland, your thoughts rightly turn to Edmund Rice and to the heritage he left you. Remember always the incomparable value of total consecration to our Lord Jesus Christ – a consecration ratified each day by prayer and effort. Remember the personal fulfilment that comes from ecclesial availability. Remember the sanctifying and evangelizing power of your vocation: facere et docere. To all of you my special Apostolic Blessing, with my prayer that you will persevere in courage and be renewed in holiness."